Jean-Paul Sartre (1905-1980) was one of the most influential of all the existentialist philosophers. An avowed socialist, Sartre weaved in themes of class struggle along with musings about human existence and the value of life. He is most known for his dark play No Exit, which continues to be performed on the stage to this day. Sartre was born in France in 1905. His father was an officer in the French Navy and he passed away while Sartre was still a very young man. He lived with his mother in different regions of France and took a very serious interest in his education and the arts when he was still a teen. However, Sartre was severely bullied by his peers, possibly because his academic and artistic interests made him an outsider. This may have set the stage for a future interest in the somewhat cynical philosophy of existentialism. Sartre would eventually read a work that would have a very significant impact on his intellectual pursuits. The work was Time and Free Will by Henri Bergson. It was rooted in theories of duration, meaning that it was concerned with the subjects of time and consciousness. Sartre would go on to continue his academic career and would eventually receive a degree in philosophy from the École Normale Supérieure. He eventually learned to live a more disciplined life when he became a member of the French armed forces in 1929. His work for the service centered on being a meteorologist. Sartre took up residence on Rue Bonaparte in 1945. For the better part of the next 17 years, he produced an enormous amount of acclaimed work in prose and for the theater. He also became the editor of a literary and political review journal. During this time, he wrote his classic trilogy of novels, The Roads to Freedom. Sartre became an outspoken critic of France’s colonialism of Algeria. In 1943, he wrote many works that had political slants to them. He became an ardent Marxist since Marxism stressed the struggle of the oppressed and this fit conveniently in his anti-colonialism ideology. Sartre believed all human beings were condemned to be free and they did not come into the world as a result of a divine creator. This is because human beings did not have a preordained plan in life and wandered through it often making bad decisions for themselves. As with many other existentialists, Sartre believed the meaning of life came from experience. As a result, those with limited experiences do not actually live. Such themes would be present in his most famous work, No Exit. In this play, lost souls muse over their condemnation to hell, with hell being a single room that three people are locked in for all eternity. 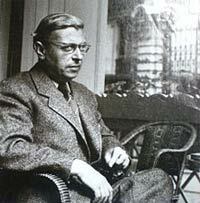 Jean-Paul Sartre passed away in 1980 of a lung-related illness. His work still continues to influence many intellectuals and artists.